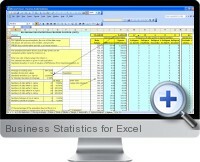 Business Statistics for Excel provides calculations of statistics for business process and investment analysis. The Business Statistics for Excel template provides all the tools and guidance necessary to calculate these frequently used statistical values for business data analysis, quality control, system control, stock and commodity prices and index forecasting, and other applications. In real business situations, such as quality control analysis, tracking order statistics, analyzing stock or commodity prices, data arrays frequently require adjustments so that the figures are realistic. With Business Statistics for Excel you can eliminate zeros from statistical calculations if needed and/or set upper and lower boundaries as acceptance limits. For example, when analyzing the average, range and frequencies of full time salaries the user can choose to eliminate part time salaries below a specified amount from the salaries list. The Moving average tables provide instant moving average values for historical data over any two periods. Excel's Forecast function can be applied in the Add Trendline Chart dialog to create moving average forecasts. The Sigma table can transfer any number of collected quality control figures (up to 10,000) into the Sigma table, eliminate zeros again (if desired) and calculate sigma values, and the number of values that lie within 1 x sigma, 2 x sigma, 3 x sigma, 4.5 x sigma and 6 x sigma range. Six sigma is one of the top rated management tools for analyzing quality control data. Statistical tables can be modified to accept percentages, currency values or just numbers. Business Statistics for Excel comes with easy to follow instructions for the beginner in business statistics calculations.